In late June, Wayne County Gem and Mineral Club visited St. Lawrence County. One stop on the three day field trip was at the Valentine Mine in Harrisville where the quarry/mine operators, Gouverneur Talc Co., graciously permitted us our annual visit. Naturally all were drawn to the bright blue calcite and the brilliantly white wollastonite (the site’s economic resource), but there is another interesting rock to be collected there. 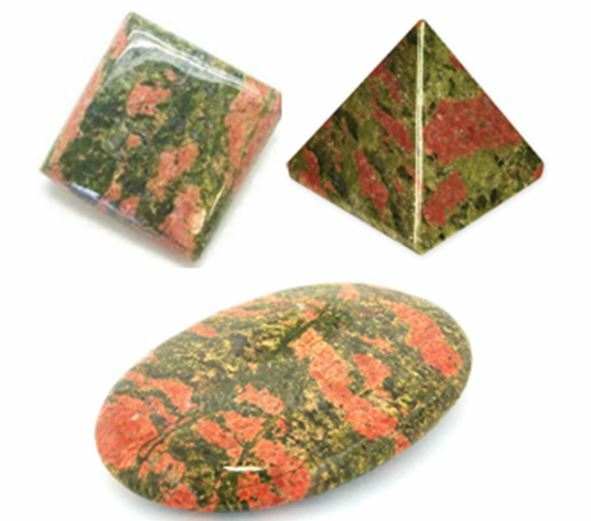 Bright orange and green unakite can also be found. 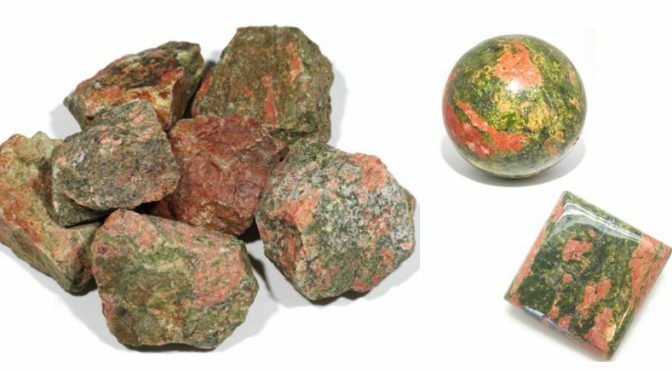 Unakite is actually a metamorphic rock. It is metamorphosed granite where plagioclase feldspars have been altered to pistachio green epidote by the intrusion of calcium and iron bearing hydrothermal fluids. This occurred after the primary Adirondack metamorphic event during the uplift of the region that brought the rocks to the surface. UNAKITE: On the left is a pile of unakite at the quarry location. On the right are four pieces I rescued from the site. They currently reside in my yard patiently awaiting lapidary disposition. They are inherently patient fellows. The pink or orange color is potassium feldspar (orthoclase) which was present in the granite, but has been re-crystallized into larger and probably more colorful patches. There is locally also a small amount of clear quartz,, but it is the combination of the orange/pink orthoclase and the green epidote that brings unakite its appeal as a lapidary stone. Unakite (pronounced you-na-kite) is not unique to the Adirondacks. In fact, it owes its name to an occurrence in the Unaka Mountains, north of Asheville, NC near the Tennessee border. The region is now part of the Cherokee National Forest where the colorful stone can be found today. The Pompton Pink Granite of north central New Jersey is also unakite, the coarseness and color of which led to it being prized as a building stone. The south entrance to the Smithsonian Natural Museum in Washington D.C. was constructed using unakite from the Pompton Pink Granite as well as many New York and New Jersey early 19th century buildings. 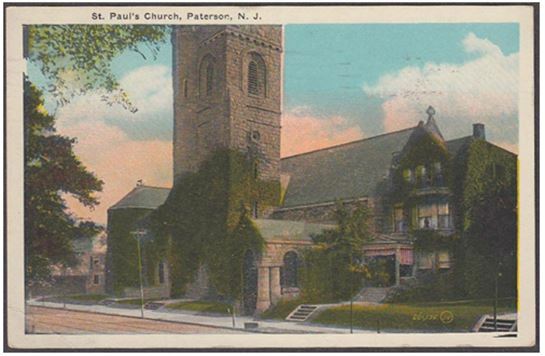 A 1927 postcard of St. Paul’s Episcopal Church in Paterson, N.J. The building, completed in 1895, is made solely of unakite, specifically Pompton Pink Granite from the Riverdale Quarry. Epidote and potassium feldspar both have a hardness of 6 on the Moh’s scale. Given a similar hardness, the two primary minerals in unakite polish evenly. Although not as hard as quartz in all its wonderful forms, the wondrous color and the friendly properties have won unakite a favorable position as a lapidary stone. Abundant and inexpensive, it is also a popular material for a rock tumbler and for cabbing. I’m sure I will find a time to try and create a cabochon or a pyramid from one of my pieces. Thank you for your most informative articles. As an amateur just starting they have been most helpful. Glad they could be of help. I enjoy writing them. Much of it is done for the Wayne County Gem and Mineral Club as I edit their newsletter. This way I am hoping some of it gets found by a few more people. Our club gets over your way about once a year for garnet collecting and whatever else we can manage to find to do in that area.